bandv and Stannah Lifts: PR in Action! 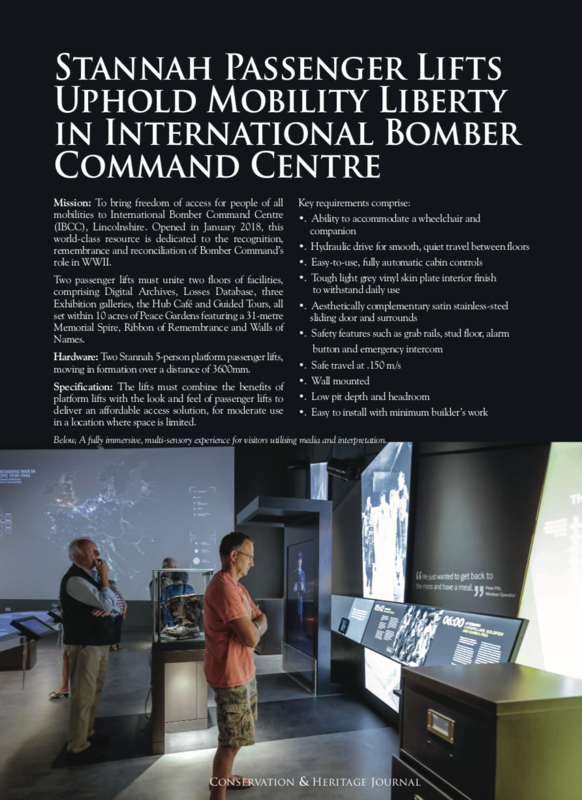 How about this for bandv PR in action?—A four-page editorial on the two Stannah passenger lifts installed in the brand new International Bomber Command Centre in Lincolnshire, to feature in the Conservation and Heritage Journal. It's the latest in a long line of PR stories that bandv orchestrates on Stannah's behalf, on an annual basis. We handle every aspect in this process—from gaining permissions and organising photography to writing and posting on the Stannah website's News section, and to distributing to trade publications—a glowing example of harnessing the power of inbound and outbound marketing. The bandv PR team is skilled in building and maintaining relationships with everyone involved, from key Stannah personnel to contractors, subcontractors, business owners, site managers, architects, specifiers, publishers—whoever and whatever it takes to push the news out there! —with a big thank you to Stannah Lifts, Nicky Barr, Chief Executive at IBCC, Dave Moss Photography, and Chris Thornley, Business Development Manager at Conservation and Heritage.